Your heart rate provides a method to monitor your exercise intensity and ensure you gain the most benefits. Your maximum and target heart rates tend to decrease with age. 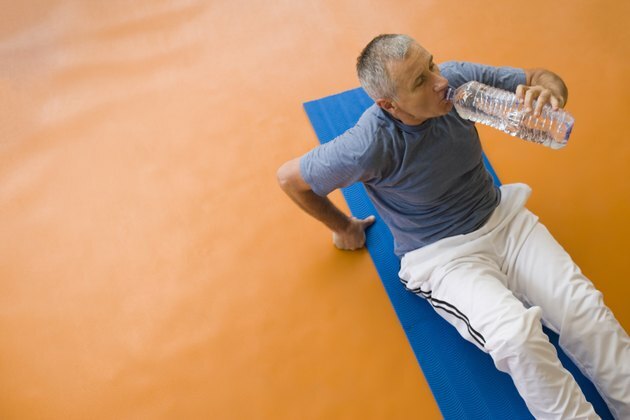 If you're a healthy 70-year-old man, you should aim to reach at least 75 beats per minute during aerobic exercise. This number will vary if you have any health conditions, or take certain medications. Talk to your doctor before starting a new exercise routine. You can roughly calculate your maximum heart rate by subtracting your age from 220. For a 70-year-old man, your MHR is around 150. The American Council on Exercise advises exercising at between 50 and 80 percent of your MHR, which is 75 to 120 beats per minute. Never exceed 85 percent, as this could cause cardiovascular problems. A normal resting pace for adults is between 60 and 100 beats per minute. When exercising, stop occasionally and press two fingers to your wrist to measure your pulse. Count for 30 seconds and multiply by two. Alternatively, wear a heart rate monitor. If your heart rate is too low, try pushing yourself harder. Slow down if your heart rate is too high. You should be able to carry on a conversation while exercising, without struggling to catch your breath. Check your heart rate one minute after you finish exercising, and again and 10 minutes afterward. After one minute, your heart rate should have fallen by 15 to 25 beats per minute from your peak rate. After 10 minutes, it should have returned to your resting level. If it takes longer to fall, talk to your doctor about your heart and its response to exercise. Keeping fit is important at every age. ACE advises 30 minutes of moderate physical activity most days for older adults. Aerobic exercise strengthens your heart and muscles, and boosts your mood, energy and endurance. It also helps control your blood sugar and cholesterol levels. Brisk walking, biking and swimming are healthy activities to try. If you're new to exercise, or haven't exercised for some time, start with just five minutes each day, working up to your target heart rate. Since you lose muscle mass as you get older, include strength-training exercises twice a week as well. If you're obese, have high cholesterol, a heart condition or other health problems, consult your doctor before starting to exercise. Stop if you find you're struggling to breathe, have painful muscles or feel you're overexerting yourself. Some medications, such as beta blockers, tend to lower your heart rate, meaning you might not be able to reach your target. Ask your doctor for advice on reaching your fitness goals, especially if you're taking medication to treat a medical condition.